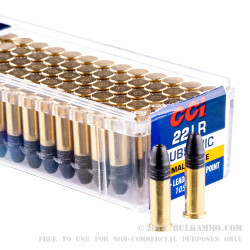 Buy 5 boxes of CCI Rimfire ammo and get a rebate for the value of the cheapest box! This is essentially 20% off any CCI Rimfire ammunition when you use this rebate through 3/31/19. Max savings of $200! 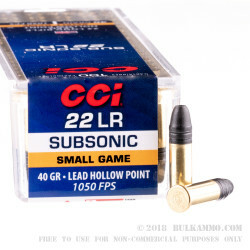 Need a subsonic .22LR cartridge for use in a suppressed firearm, that can maintain the type of consistency you want? Look no further. Running at 1050 feet per second of muzzle velocity and delivering about 100 ft. lbs of energy, this is a relatively potent round for the .22 long rifle and gives you a real test bed for tuning your suppressed setup in the real world. 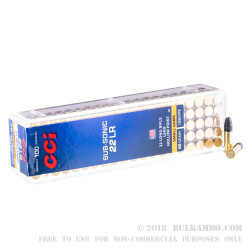 .22LR from CCI represents a very reliable platform for CCI historically – meaning you can rest easy that your money is well spent. Other than the fact that this is under the 1100 fps threshold to avoid cracking the sound barrier, this is a relatively standard load for the .22LR. it should offer full functionality to most .22LR firearms and give good ballistics and accuracy out to reasonable distances. 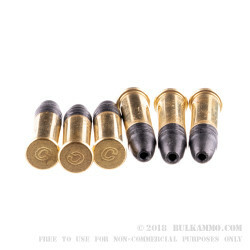 Note: subsonic ammunition does suffer a bit on longer range accuracy, so you’ll need to test the max distances given your barrel length and application, but generally you should expect fine accuracy to normal plinking and reasonable target distances with this ammunition. Suitable for use in suppressed .22LR firearms. Subsonic ammunition may not fully cycle all firearms.